Martha Sear was close to tears as she described how precious a newly acquired thylacine pelt was – a symbol of extinction, beautifully kept with intact paws, whiskers, nose and a thick winter coat. The National Museum of Australia curator has seen the rare skin finally returned home after being missing for almost 100 years, spending part of its life unnoticed under a power cord in a New Zealand canoe hire shop. “It’s a deeply moving object. To be alone with it, to look at it, it touches you,” Dr Sear said. 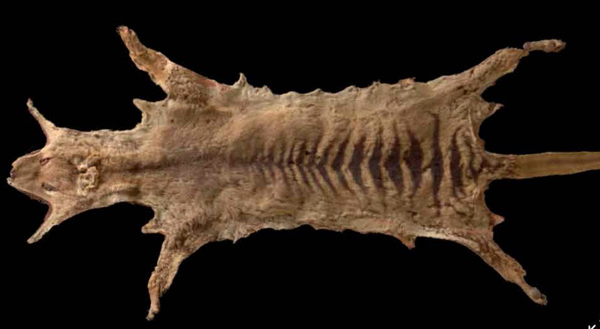 The museum recently bought the preserved pelt of the Tasmanian tiger, extinct since February 7, 1936, for $250,000. “When you think about what that loss has meant … the apex predator has gone and that has changed Tasmania forever,” Dr Sear said. The pelt has been missing for nearly 100 years: taken from Tasmania by a New Zealand taxidermist Archibald Robertson in 1923, it was inherited by his daughter, Janet Withers, in 1970. She loaned it to a North Island canoe hire shop owned by local taxidermist John McCosh, where it was stored under a power cord in 1999, and eventually rediscovered by a local museum curator, who posted an image of it on social media in 2017. Now, scientists in Melbourne are using the DNA extracted from the pelt to further study the animal while conservators work quickly to have it on display in Canberra. The skin, one of the best preserved in the world, may give scientists the chance to bring the animal back to life, while museum staff hope the pelt serves as a precious symbol of modern extinction. Tasmanian conservator David Thurrowgood recalls getting a call from an English thylacine research group who saw the post on Twitter. “They became quite concerned it could end up going astray,” Mr Thurrowgood said. He said strangers had started offering Mr McCosh $1000 for the skin – peanuts compared to the $250,000 it sold to the National Museum for in December last year. Already noticing the huge amount of attention the skin was getting at the time, Mr McCosh contacted Ms Withers, who contacted Mr Thurrowgood. He was concerned Ms Withers would be swindled out of the skin’s true value, while also wanting to ensure the object was preserved for scientific research. “She couldn’t look after it, so it went on to an independent valuation so it could be sold,” Mr Thurrowgood said.